Advantage Probe & Injection Corp. is committed to deliver quality and affordable service in the field of environmental and geotechnical investigations, and contaminate remediation injections. Our cutting edge drilling and injection technology provides our clients with site specific options in order to develop the best solutions for superior results. We adopt only the top safety practices and ensure our employees promote a safe work environment, while providing a competitive service to our clients. Advantage Probe & Injection Corp. started its operations in 2002, providing drilling services in central and western Canada. 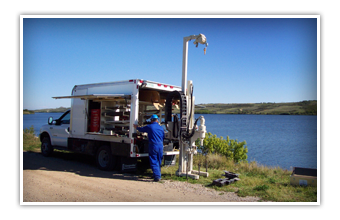 APIC is based out of Saskatoon, Saskatchewan and operates a Geoprobe 6600 series direct push rig. Due to the equipment and tools that we use, very little site disturbance is created and very little waste is generated. We are available for environmental site assessments, geotechnical investigations, and soil and groundwater remediation projects. At Advantage Probe & Injection Corp., we value safe, timely and affordable service, while providing top quality Environmental, Geotechnical and Injection Solutions to ensure our client needs are met.